For those of you that asked, here are the recipes for two of the many dishes my mom served at this year’s Easter feast—Phyllo Triangles stuffed with spinach & ricotta cheese to kick off the meal, and sweet-tart Lemon Cookies to end it. 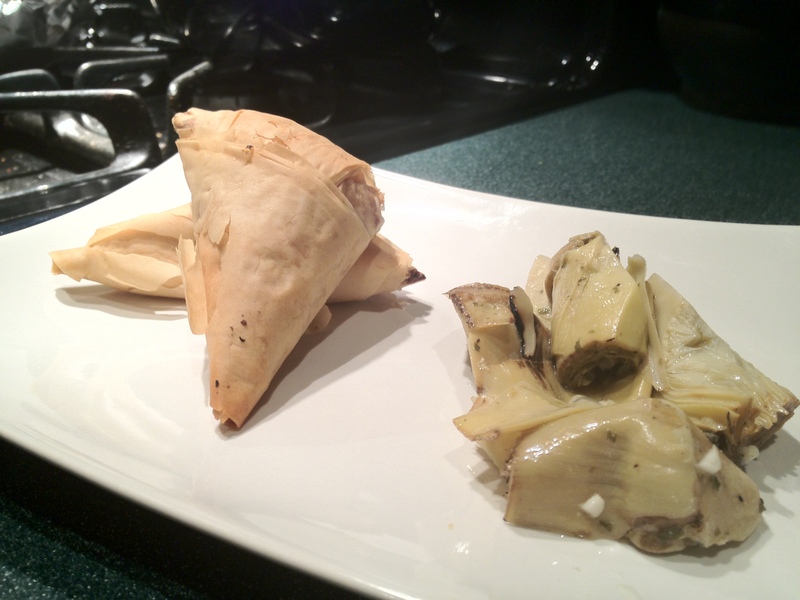 Phyllo Triangles filled with spinach & ricotta. Serve alone or with marinated artichokes. Remove spinach from freezer to defrost. When it begins to soften, use a knife to cut the block into strips, about 1” thick. Once it reaches room temperature you can start pulling it apart. Drain the spinach of any excess water using a colander, or wrap it in paper towels and squeeze the water out. Heat a skillet over medium high heat, and add about a tablespoon of extra virgin olive oil, followed by the garlic. The garlic should not be sizzling strongly; you just want it to flavor the oil. Once you see the garlic start to turn a golden brown, remove it and add the spinach and a pinch of salt. Saute for 2-3 minutes, then transfer to a bowl. After the spinach has cooled for a few minutes, add the cheeses, parsley, a generous pinch of pepper and a small pinch of salt, then finally the egg. Mix with a wooden spoon until all ingredients are combined. Combine the melted butter and 4 tbsp. olive oil in a bowl. Remove a sheet of phyllo carefully and set it on a large cutting board or other large, clean flat surface. Brush the phyllo sheet lightly with the butter & oil mixture. Lay a second sheet of phyllo on top and repeat. Cut the 2 layered sheets into 5 strips. Towards the bottom of the first strip, in the center but towards the right, apply 1 tbsp of the spinach/cheese mixture, and fold according to the diagram below. 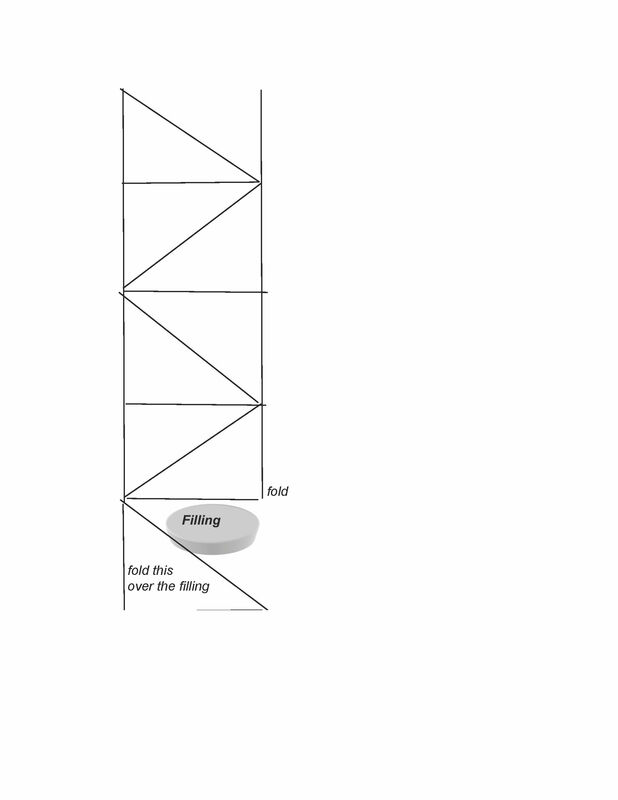 How to fill, shape and fold your triangles, courtesy of Mom. Brush the top and bottom of the stuffed triangle with the oil/butter mixture, and set the triangle on a cookie sheet. Repeat the process with the remaining phyllo and filling until you run out. The triangles should be 1.5” – 2” apart on the cookie sheet. Use more if needed. Pre-heat the oven to 350 degrees. Bake the triangles for about 25 minutes, until they turn golden all over. Serve immediately, or cool completely and refrigerate for up to one week. Heat before serving. Combine flour, baking powder and salt; set aside. Cream butter and sugar together with a mixer, then add eggs, one at a time, followed by extract. Continue beating and add the flour mixture, and as it incorporates into the dough, add the milk. Mix until all ingredients are thoroughly combined. Refrigerate the dough for at least one hour. Pre-heat oven to 350 degrees. Using a tablespoon to shape each dough mound into a ball, place each dough ball about 2 inches apart on a parchment-lined cookie sheet. Bake cookies for 12 to 14 minutes, until they are just turning a light golden brown at the edges. Mix ingredients thoroughly with a spoon or whisk. The mixture should not be watery. When ready, apply about a spoonful of icing to each cookie and coat with your fingers. Allow the icing to solidify for about two hours. Serve immediately, or store up to 4 days in a cookie tin lined with wax paper. Do not store the cookies in a plastic container (it makes the icing funky). 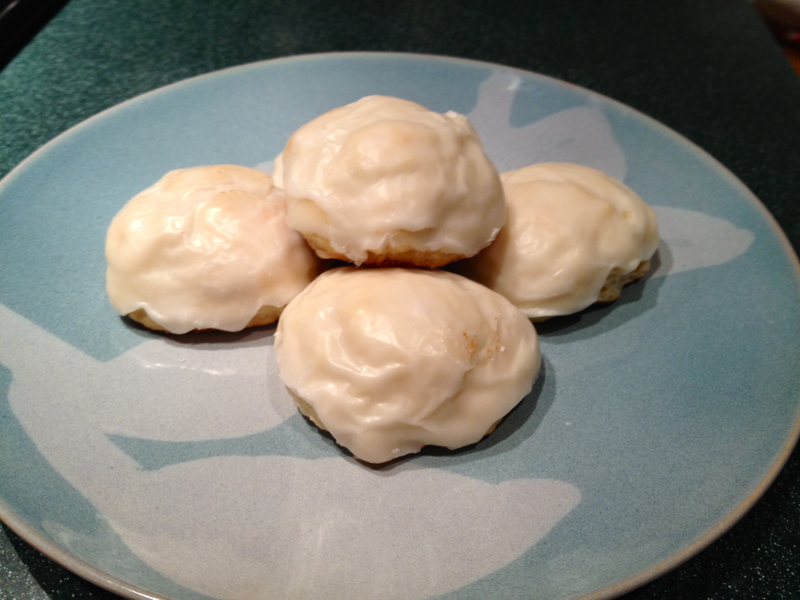 This entry was posted in Musings, Recipes, Savory, Sweet Tooth and tagged appetizers, baking, biscottini al limone, cheese, cookies, desserts, easter, easy, holidays, italian, lemon cookies, mom, photos, phyllo dough, recipes, ricotta, special occasion, spinach. Bookmark the permalink. Thank you and your mom for these recipes. Will have to make these soon! You’re very welcome, and sorry for the delay. Enjoy! I’d love to hear how everything turns out.